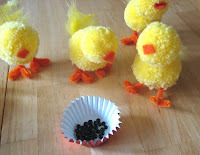 My Blog: Easter Chicks for my Peeps!! After watching an old Martha Stewart show and chicking out, or I mean, checking out my friend, Dees blog... 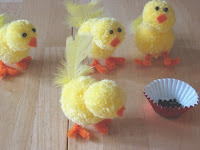 I really got in the mood to make a few chicks for my family Peeps!! Here they are, just on the kitchen table... bumping into each other! I left them without eyes for a day and my did they get into trouble!! They did grow some tail feathers during their time of waiting for some eyes. After rooting aroudn for some black beads for their eyes, I gave them the eyes that they rightfully deserved! This little guy went off on his own and I had to go after him to put his eyes on... he was almost out the front door. How he unlocked it, I'll never know!